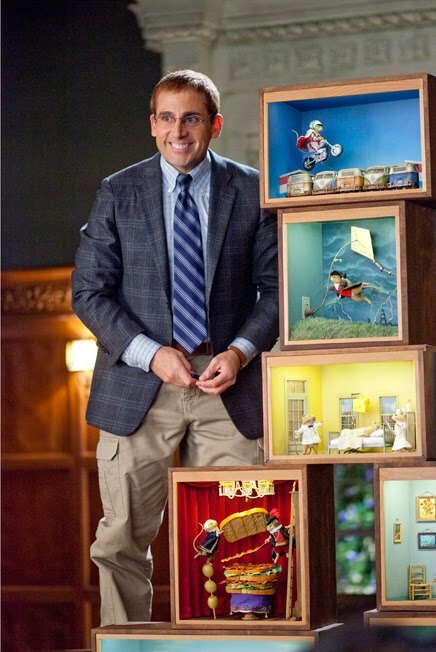 Dinner for Schmucks stars Steve Carell and Paul Rudd, and, for better or worse, that’s all you really need to know about it. Rudd has built a career playing sardonic straight man to a bevy of clowns – Jason Segel, Seth Rogan, Will Ferrell, and even Steve Carell previously in The 40 Year Old Virgin. Dinner for Schmucks is officially a remake of the 1998 French film Le Dîner de Cons, an adaptation of a Francis Veber play. In execution, it is yet another in the tired line of mismatched-buddy comedies held together not by a script but arid improv. Rudd plays Tim, an up-and-coming financial executive who angling for a promotion by trying to land the account of Swiss multi-millionaire. Part of his induction up the corporation ladder also involves attending a monthly dinner party in which employees invite eccentric strangers who are secretly mocked and unwittingly compete for the title of the night’s biggest idiot. Tim’s moral dilemma over taking part quickly ends when he literally runs into Barry (Carell), an IRS employee and amateur taxidermist with a passion for creating elaborate diorama using dead, stuff mice. Tim invites Barry to the company dinner, unaware of the mayhem Barry’s entrée will have on his personal and professional life. Carell is an amusing performer, but his shtick can get mired in a one-note rut. Here, Barry sports a funny hairstyle and a silly grin, a set-up accented by Rudd’s droll comebacks and one insipid sequence after another. The result is uneven and surprisingly dull – for me, the only real laugh was seeing Ron Livingston, star of Office Space, cast as a soulless corporate lackey. The fact that Tim uses Barry for his own selfish motives at Barry’s expense is distasteful. But, the film waves aside the fact that Barry blindly, gleefully wreaks havoc with Tim’s life by convincing both he and his art curator girlfriend Julie (Stephanie Szostak) that the other is carrying on an affair, Tim with a former fling and stalker named Darla (Lucy Punch) and Julie with Kieran (Jemaine Clement), her bizarro performance artist client. Instead, it reserves scorn only for Tim when he has the temerity to express consternation about his new annoying acquaintance. But, director Jay Roach – who lacks the talent to carry off such a black comic conceit – saves the film’s biggest flaw for the titular dinner show. We are supposed to wag our fingers at Tim’s boss (Bruce Greenwood) and his rich minions for cruelly cackling at the evening’s “entertainment,” which includes a pet psychic, a vulture wrangler, a blind fencer, and even Therman (Zach Galifianakis), Barry’s coworker who claims the gift of mind control and taunts Barry about the fact that he is sleeping with Barry’s ex-wife. At the same time, however, the movie’s comic hook rests on the audience’s shared schadenfreude over these oddballs, Barry included, thereby encouraging us to partake in those same shark-tank antics. Ultimately, the only schmucks at this Dinner are the ones foolhardy enough to fork over money to see it.